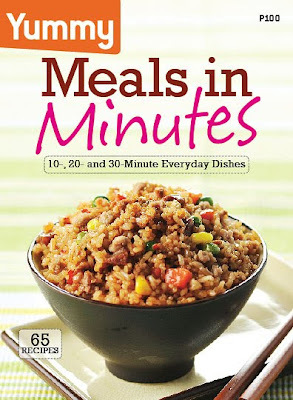 Presenting, the first ever Yummy Book entitled Meals in Minutes. This is the first of three books that we will be launching for this year. You'll love this first book because it presents 65 super easy recipes! I'm talking about the kind that you can easily make in less than 10, 20 or 30 minutes! It's like a cooking show on print! You'll also love the beautiful mouthwatering photos that will encourage you to try the recipes yourself. Oriental Fried Rice. Not known to many, fried rice is my weakness. I may be able to skip not eating plain rice for a year but cook it with some oil, as some garlic, onion leeks, meat and egg then that's when I raise the white flag on one hand and a spoon on the other. 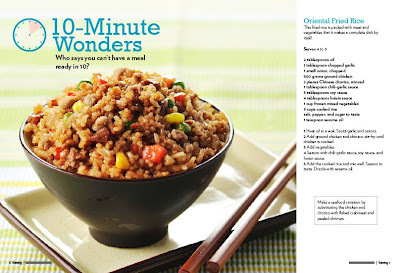 I totally adore eating fried rice and I'm so happy to have this as our cover recipe. Another reason why you'll love the book is because it's very affordable! Imagine, one book is only for P100! Such a very reasonable price in exchange of 65 exciting and easy-to-do recipes! What a steal! 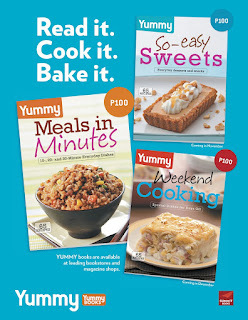 Watch out for the next two books coming out soon : So-easy Sweets and Weekend Cooking. Hi, Franny! 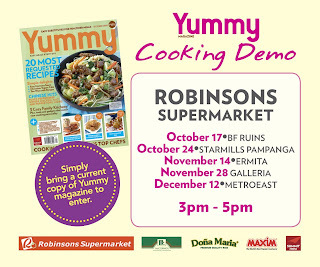 After you Plurked about this last week, I was on the lookout na sa mga bookstores and magazine stands. I got hold of a copy just last Saturday, and what can I say? I simply LOVE it!! My hubby loves it too coz cooking is one of our bonding activities. Thanks! Hi Fran, got my copy today! I ripped off the plastic wrap immediately after I paid (no kidding) haha! I must say you did a great job and I look forward to the next book. Thanks and more power! Hi Fran, just bought a copy last Sunday! And can I just say how much I love the recipes you included here. Plus I owe everybody who made this a big thank you hug! You see, Mark loves hash browns. So when we were browsing the pages and I saw the Hash Brown Sloppy Joes, I joked to him that I'll make him fall in love with me by cooking him this recipe, tapos he said "bakit pa? in love na nga ko eh." waaaaaahhh!!!! girl naloka ko! cheesy pero super sweet! haba ng hair feeling! hahaha! so thank you thank you thank you! Can't wait for the "So-easy Sweets" book! Kudos to all Yummy Staff!